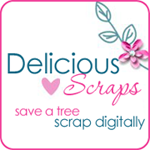 Delicious Scraps: Happy Family Day and a Freebie! Happy Family Day and a Freebie! Happy Family Day!!! and President's Day!! :) Dollar Sale Continues at my shop! I was playing around with styles and patterns in PSE 7 and made this cute alpha. It is OK for Commercial Use. I hope you can use it. Of course I can use it!!! Hi! You must be from Alberta! Happy Family Day. I was wondering if I could ask you a question about selling your kits? Oh my goodness yes, in a thousand ways! Thank you!